Attention, all Wildwoodians with an interest in thunderous low-end! 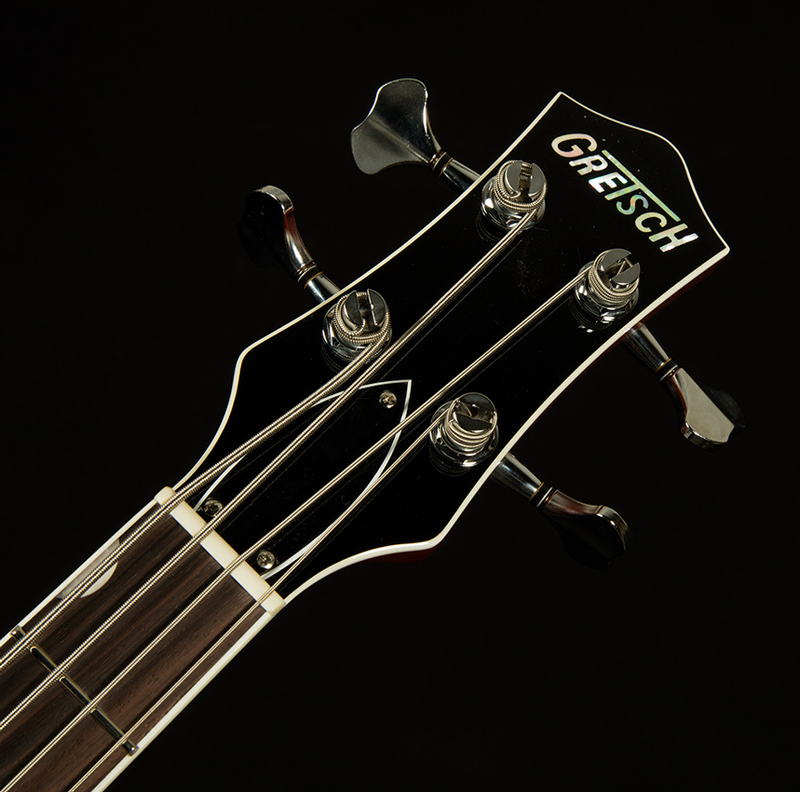 We have a real treat to offer you: the Gretsch Thunder Jet. As its name implies, the Thunder Jet is a bass with a Jet-style body made of chambered mahogany with a laminate maple top. It is indeed quite thunderous, and a lot of fun to play thanks to its short 30.3" scale length (about four inches shorter than a typical Fender bass). Aside from the ergonomic benefits of a short-scale (less string tension equals slinkier handfeel, making this a perfect bass for guitarists looking to dip their toes into the world of bass), a shorter scale does three things on a bass: it makes the attack woodier and more articulate, imparts extra warmth to the tone, and generally creates a more upright-like timbre. 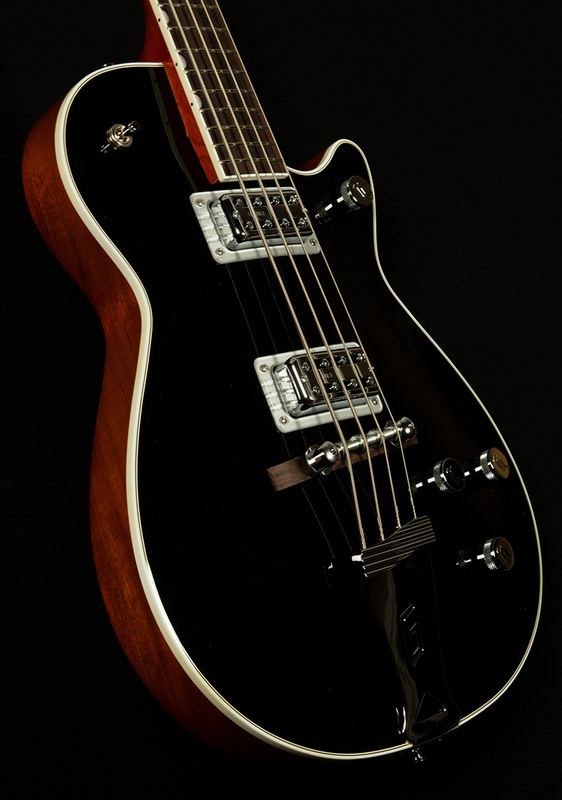 A short-scale neck is a match made in heaven with a chambered mahogany body with a maple top. Mahogany's innate warm, woody tone shines through here, and the chambers improve its articulation and clarity. From there, the maple top further enhances the attack while adding a glassy, clear sheen to the top-end. From there, two Thunder'Tron pickups (doesn't "Thundertron" sound like a cartoon villain's name?) provide a dose of low-end special sauce. Its bridge pickup is everything a bass bridge pickup should aspire to be. There is tight low-end with enough boom to sound satisfying, there is a dense, powerful, punchy midrange and there is plenty of aggressive bite in the high end. By contrast, the neck pickup sounds positively cavernous. Its low-end is cannon-like, its midrange is warm and thumpy, and its highs are articulate and clear. Though it provides Leviathan-worthy lows, it still sounds remarkably clear and articulate, perhaps because of the maple top. When you use these two pickups together, they form an unstoppable Thunder Juggernaut with full frequency response over the entire harmonic spectrum. The bridge pickup fills out all the space that the neck pickup doesn't cover, and it is glorious. The highs are meaty and full, the lows thump with authority, and the midrange envelops you in warmth. Though there is nothing out there that sounds quite like the Thunder Jet, there are a few points of comparison. On the whole, it sounds like a hulked-out viola bass. Imagine if Paul McCartney's bass tone lifted weights every day while consuming 4,000 calories, mainly in protein shake form. That will give you a rough idea of the Thunder Jet's singular sound. We're proud to showcase such an exceptional instrument, and we are certain its stellar tone will invigorate your playing and bring you a lifetime of low-end joy.